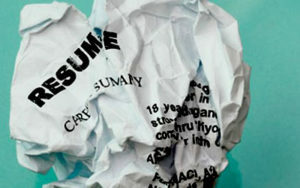 Resume fudging is an act of intensifying an applicant’s qualifications through high-level sensationalism. Fudging has been effective, yet risky strategy for entry level applicants who are eager to climb the corporate ladder without spending time at the bottom. Because most hiring managers won’t even notice, applicants fudge their application in order to get past through today’s tough job market condition. Jobs are scarce, and many college graduates resort in faking their qualifications to escape sudden unemployment. Human resource officers in the United States report that almost one of the resume will be fudged or padded. The rise of such cases triggered many companies to tighten its security against applicants who are willing to go the distance and sensationalize their application. Many applicants fumble the first time they fudge their application. Hiring managers point out inconsistencies as the very first sign that the resume is, indeed, padded. For example, an applicant will immediately include his/her expertise in using Adobe Photoshop, but does not clearly elaborate on what areas of Photoshop the applicant is known for. Hiring managers can easily combat false recommendations cooked up by the applicant. For instance, searching or calling the person that made the statement still remains pragmatic. However, applicants have become more mischievous as of the late and will not include the name and contact details of the individual that has rendered the written recommendation. Creating an impression is important when applying for a job. Applicants desperate to land employment fabricate different positions that they never once handled. Along with these positions are high-sounding responsibilities that even CEOs may find very challenging and impossible to accomplish. Applicants are very much aware that employers are impressed with people with sterling academic titles hanging above their heads. Applicants play within using a fictional degree they have obtained from reputable universities or colleges. Applicants also pad their job objective knowing that they are not whole-heartedly interested in the position they are applying for.